The spinal cord is a bundle of nerve fibers, no thicker than the human thumb, that links the brain with the rest of the body. The spinal cord is protected by the vertebral column, and together with the brain it comprises the central nervous system. The nerves that enter and exit the spinal cord form the peripheral nervous system. rough sandpaper or smooth silk. In contrast, the nerves that exit the ventral surface (closest to the stomach) of the spinal cord carry information from the spinal cord to the rest of the body. These nerves enable a person to jerk his or her hand away from a hot pan or throw a dog a ball. The term for nerves that conduct commands from the spinal cord to muscles and organs is efferent. 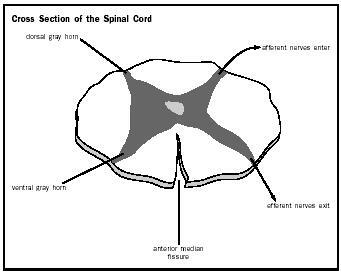 The afferent and efferent nerves are associated with an H-shaped area of gray matter in the center of the spinal cord. The gray matter is separated into dorsal and ventral horns. The ventral horn contains the cell bodies of efferent neurons that control muscles and organs. The sensory nerves enter the dorsal horn where they make connections with nerve cells that travel to the brain. The gray matter is surrounded by white matter, which contains the long projections of nerve cells (called axons ) that carry information to other parts of the nervous system. Axons that carry similar information are grouped into bundles or tracts. Many tracts start in the dorsal horn and carry sensory information from the cord to the brain (for example, the message that the hand is touching silk instead of sandpaper). Since these neurons are traveling "up" the cord, they are often referred to as ascending tracts. In addition to ascending tracts, the white matter also contains descending tracts. As the name implies, these tracts begin in the brain and travel down the spinal cord to make connections with neurons in the ventral horn. They provide a person with voluntary control of his or her muscles, as well as the involuntary control over internal organs. In short, the spinal cord carries all of the information that enters and exits the brain. Therefore, it is not surprising that when this flow of information is blocked by injury, the consequences are devastating. Patients suffer paralysis and loss of sensation in their legs (paraplegia) if the lower part of the cord is damaged, or in their arms and legs (quadriplegia) if the injury is in the upper regions of the cord. In addition, control over urination, defecation, and sometimes respiration is lost depending on the level and extent of the damage. Once the spinal cord has been injured, the damage is usually permanent. Physical therapy can enable a patient to regain a small amount of movement over time, but the medical field has yet to discover a way to reconnect the severed nerve cells to produce normal function. Martini, Frederic H., and Edwin F. Bartholomew. Essentials of Anatomy and Physiology, 2nd ed. Upper Saddle River, NJ: Prentice Hall, 2000. Martini, Frederic H., Edwin F. Bartholomew, and Kathleen Welch. The Human Body in Health and Disease. Upper Saddle River, NJ: Prentice Hall, 2000. McDonald, John. "Repairing the Damaged Spinal Cord." Scientific American 280 (1999): 65–73.